Chickens are found around settlements, and nearby NPCs may express unhappiness if they witness one being killed. Chickens may drop guts upon their death. Baan Dar's Bash: Join Baan Dar's party! 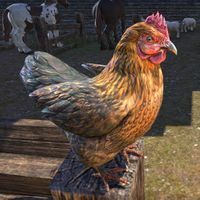 ​ Poultry Assassin 5 Kill a livestock chicken or bantam guar. This page was last modified on 11 May 2018, at 17:26.